Like a bulldozer, she has been demolishing American women for over a decade. Or maybe decimating. Obliterating. The aftermath of her participation often leaves these competitions looking more like massacres. Or maybe slaughters. Exterminations. And best of all, just like her methods, her name is Krush -- a pun that would have worn thin years ago if it all weren’t so blatantly obvious. Is there no one left to stop the tyrannical reign of U.S. Women’s Chess Champion Irina Krush? The time draws nigh for the return of America’s queen, who arrives back in St. Louis in less than three weeks to defend her crown, just like she did last year. And the year before that. In fact, Krush will descend on the Chess Club and Scholastic Center of St. Louis at the end of March, ready to attack the 2015 U.S. Women’s Championship in search of her seventh national title, making it her fifth in the last six years, and her fourth in a row. She notched her first-ever U.S. title as a 15-year-old in 1998, the youngest in history to do so, and these days seems to have improved to a level simply beyond what the rest of America’s women have to offer. If the Krush were to have a kryptonite, it would be IM Anna Zatonskih -- the only other to win the women’s national title since 2006. Both currently tied as the 27th-best women on the planet per the latest World Chess Federation rankings, Krush and Zatonskih have turned the U.S. Women’s Championship into more of a see-saw fight for the better part of the past decade: Zatonskih winning four times to Krush’s five. But with that truth comes the reality behind the upcoming 2015 title fight: Zatonskih, who just celebrated the birth of her child, declined her invitation for 2015 -- leaving the U.S.’ biggest shark alone in the pond. And even worse for the rest of America’s female hopefuls: This year, someone has poured blood into the water. Beyond the event’s $75,000 prize fund, American chess’ biggest fan and benefactor Rex Sinquefield has offered a $64,000 “Fischer bonus” to the U.S. Women’s Championship. Sinquefield, boasting an avid obsession of the American legend, has offered the prize to any competitor who can match Bobby Fischer’s incredible 11/11 score from the 1964 U.S. Championship -- the only perfect score in the history of the tournament. The achievement, of course, is a statistical pipe dream. Fischer’s monumental effort was a rarity that demonstrated clear and total dominance over the field, one that has never come close to being repeated and likely never will. But Krush has been flexing a similar dominance lately, pushing even Zatonskih by the wayside for the past three years. In fact, Krush has not lost a single game in the U.S. Women’s Championship since 2011. She has also come close to perfection several times before, scoring 8.5/9 for her first title in 1998 and, more recently, notching 8/9 with two draws in 2013. Again begging the question - with even more concern now that Zatonskih is out of the running - exactly who plans to stand in the path of the Krush? WGM Tatev Abrahamyan has more to prove than statistical improbabilities. The 27-year-old has worked hard to insert herself as the third wheel to the two-horse race, tasting everything but victory just last year. Abrahamyan forced a three-way playoff for the 2014 Women’s Championship, first knocking Zatonskih off on the final day, before taking a crack at Krush for the title. She lost, but Zatonskih’s absence in 2015 just means she had less in the way for another swing at Krush. IM Rusudan Goletiani should put up a fight as well. The 2005 U.S. Women’s champion, the last to win a title before Krush and Zatonskih began trading jabs, was a two-time World Champion for girls and returns to the U.S. Women’s championship after a few years off, possibly with a few new tricks. The field behind Krush has been strengthening too, predominantly by a recent influx of overseas talent transferring to the burgeoning American chess scene. Last year’s transfer WGM Katerina Nemcova finished a respectable fourth in her first U.S. Women’s championship, and also earned a seat next to Krush, Zatonskih and Abrahamyan on the U.S.’ 2014 Olympiad team. This year’s new transfers are WGM Anna Sharevich, a former Lindenwood star who found a new home inside Webster University’s dominant collegiate program; and IM Nazi Paikidze, who will take the University of Maryland-Baltimore County to square off with Webster in the 2015 Collegiate Final Four, just days before the U.S. Women’s Championship. The U.S.’ home-grown talent is blossoming as well, this year’s field featuring Jennifer Yu, who won the first world title for an American girl since 1987 at the 2014 World Youth Championships; and 12-year-old Annie Wang, who became America’s youngest female master last March, breaking a record held since 1996 -- by Krush. Indeed, the U.S. Women’s field grows in strength with each passing year -- but right now is the only year that matters. And right now, there’s blood in the water. 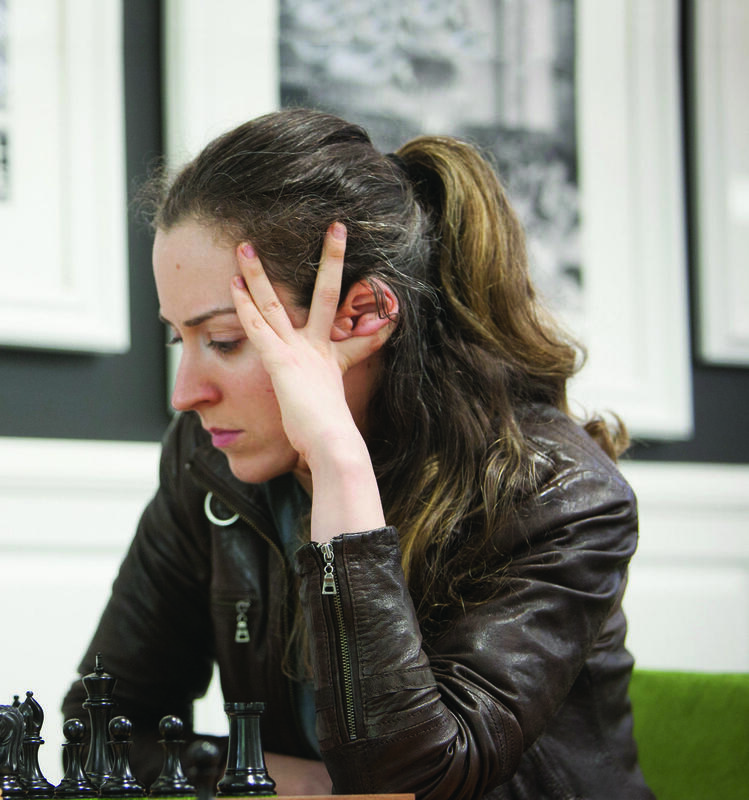 Irina Krush is the shark -- the only pure Grandmaster in the field -- with the title and the experience that separates her from the rest, and the tools to make a concerted run at the table. This year, the question may not be who might stop Irina Krush, but who might slow her down? Editor's note: For another look at the St. Louis chess scene, Your Move, Grandmaster, (To the U.S., Please) from the March 11 New York Times.